In many fisheries, you hear a lot of talk about the ecosystem impacts of fishing. This includes the collateral damage of bycatch. And it includes ‘trophic cascades’, where by fishing down one species, there is a cascading impact on the food chain. Perhaps the most famous example of this is the impact of the collapse of Northwest Atlantic cod stocks. That means the true costs of fishing are far greater than the costs of operations and marketing, and that it is very likely that the consuming public is being ‘over served’ on certain fish species. 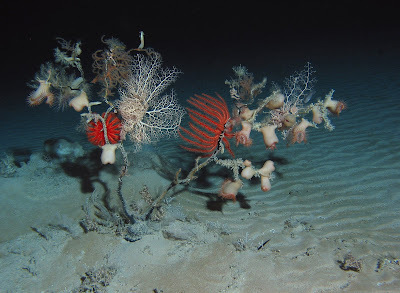 The deep sea is full of delicate life, such as this assemblage of anemones, brittle stars, and corals. Credit: Sönke Johnsen. Bottom trawl gear destroys important habitat that sustain the ecosystem. The destructive gear — used to catch an estimated 80% of deep-sea species on the high seas — leaves coral gardens and sponge beds devastated. These habitats provide many important ecosystem services to other species, including those targeted by deep-sea fishing operations. For instance, off the coast of British Columbia, a study found that trawled areas had 13 times less coral and attracted few rockfish, an important target species. Deep-sea fishing frequently yields large amounts of bycatch. For instance, one study found that between 1995 and 1997, an average of 48.5 percent of French deepwater fish catches in the Northeast Atlantic were discarded as undesirable. More recently, ICES reported that bycatch accounts for about 30 percent of catch in weight and 50 percent in number for French fleets targeting roundnose grenadier in the Northeast Atlantic. It is also clear that the bycatch of deep-sea species is far more ecologically damaging than the bycatch of shallow water species. Most deep-sea fish cannot survive the changes in pressure as they are brought up from the depths, so fish are discarded dead. And deep-sea fish are adapted to conditions of low turbulence and their skin is not covered by mucus, so there is also high mortality among fish that escape through trawl meshes. And lastly, the impacts of deep-sea fishing cascade down the food chain and into the deeper ocean. When one species’ population collapses, studies suggest that others may fall with them. In the case of hagfish, data shows that when commercial fishers went after some hagfish populations, the stock of other commercial species plummeted. It is known that by consuming the dead and decaying carcasses that have fallen to the benthic zone, hagfishes create a rich environment for other species including codfish, haddock, and flounder. A recent study found that deep-sea trawling off the coast of Ireland is likely to have caused a 70 percent decline in the abundance of deep-sea species up to a depth of 1,500 meters since 1977. Just as troubling, declines in fish abundance were observed as far down as 2,500 meters, far below the reach of the trawl nets. Ultimately, we find that the true costs of deep-sea fishing are far greater than what appear on company balance sheets. It is time we protect the deep-sea and see that short-term commercial interests do not trump those of the rest of the world. V. Allain, A. Biseau, and B. Kergoat. 2003. Preliminary estimates of French deepwater fishery discards in the Northeast Atlantic Ocean. Fisheries Research 60(1) : 185-192. ICES. 2010. Widely Distributed and Migratory Stocks. Report of the ICES Advisory Committee, Book 9. Available here. Matthew Gianni (2004). High Seas Bottom Trawl Fisheries and their Impacts on the Biodiversity of Vulnerable Deep-Sea Ecosystems: Options for International Action. Executive Summary. IUCN, Gland, Switzerland. Available here. P.A. Large, C. Hammer, O.A. Bergstad, J.D.M. Gordon, P. Lorance. 2003. Deep-water fisheries of the Northeast Atlantic: II assessment and management approaches. Journal of Northwest Atlantic Fisheries Science. Vol. 31: 151-163. C.M. Roberts. 2002. Deep impact: the rising toll of fishing in the deep sea. Trends in Ecology and Evolution, 17(5), 242-245. D. M. Bailey, M.A. Collins, J.D.M. Gordon, A.F. Zuur, and I.G. Priede. 2009. Long-term changes in deep-water fish populations in the northeast Atlantic: a deeper reaching effect of fisheries? Proceeding of the Royal Society Biological Sciences, 275: 1965-1969.